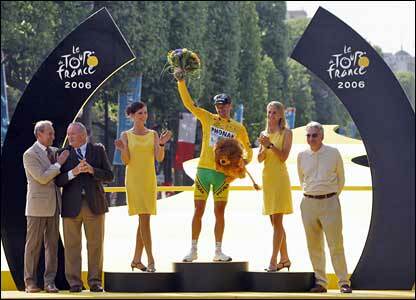 Associated Press reports that 2006 Tour de France winner Floyd Landis will publish a book before the Tour kicks off this July. 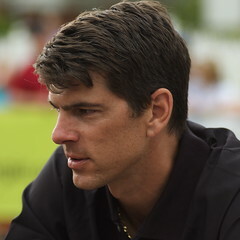 Landis, facing possible disqualification for a high testosterone-to-epitestosterone ratio, is expected to publish Positively False: The Real Story of How I Won the Tour de France in late June, addressing his childhood as a Mennonite, his racing career, and his efforts to clear his name and return to racing. Last week, Landis agreed not to race in France this year, and he faces a May hearing in front of the US Anti-Doping Agency and June proceedings from AFLD, the French equivalent. He's also 4.5 months into recovery from hip replacement surgery. The book's available for preorder at Amazon; linked at right. 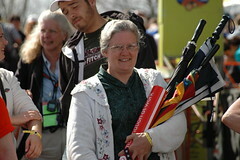 Landaluze cleared for LNDD error; hope for Landis? The Court of Arbitration of Sport yesterday rejected a final appeal by the UCI to sanction Inigo Landaluze for a postive testosterone case, citing malfeasance by the same lab that in July tested Tour de France winner Floyd Landis. Inigo Landaluze, who won the 2005 Dauphiné Libéré for Euskaltel-Euskadi, was suspended for tests performed during that race. 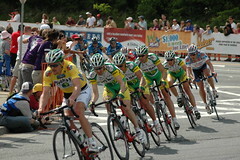 In May 2006, the Spanish cycling federation overturned the suspension (saying it was "not in accordance with all applicable legal requirements"), and the UCI appealed to the CAS. It has been indeed established that the person who conducted the analysis of the B sample was also involved in analysis of the A sample, thus in violation of the international standard applicable to the accredited laboratories. The Panel considered that the violation of this technical direction was likely to affect the results of the analyses. The Panel has considered that the non-compliance with this standard constituted a procedural flaw serious enough to cause the invalidation of the anti-doping test. That's at the same Labaratoire National de Dopistage du Dopage (LNDD) at Chatenay-Malabry that committed a boatload of procedural errors in the Landis case. Going through what I am now, I feel personally for Landaluze and hope that everyone recognizes that it has taken him 18 difficult months to clear his name from what was revealed to be a grievous error by the LNDD ... The track record of scientific misconduct at Chatenay-Malabry seems to grow by the day. 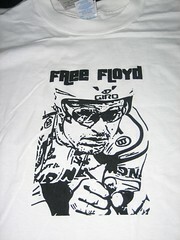 We should get to see some details on the defense of Floyd Landis later today. Landis, who showed up at a criterium near his boyhood home on Saturday, posted on his weblog Friday that his legal team will ask USADA to dismiss doping allegations against the 2006 Tour winner. Landis says his team has discovered “inconsistencies in the testing protoocol and methodology” that should lead to his case being thrown out. I'm sure whatever breaks will be covered quickly at Trust But Verify. Late Late Show host calls Landis "positive for chickensh*t"
I was just watching Craig Ferguson's opening monologue on the CBS Late Late Show. 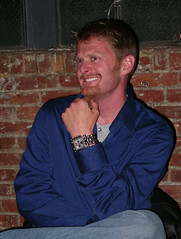 Ferguson mentioned that Floyd Landis had been scheduled to appear, and gave a rudimentary overview of the current doping case against Landis. “Hmmm,” he continued, “looks like someone tested positive for chickensh*t,” which I asterisk-ize because it was bleeped by the network, so maybe he said chickenshot, who knows. The audience ate it up. If Landis had backed out at the last minute, solely because he doesn't want to face the press, I might have considered that a fair shot, but not under the circumstances. The guy's father-in-law killed himself just Tuesday afternoon. There's probably a lot more important things he needs to take care of right now than the light-night talk shows. Update: Okay, mea culpa. It was indeed a rerun; I was thrown because a) I hadn't seen it, and b) they led it off with a teaser about coming back after the golf highlights that I thought meant Ferguson was in the studio. Apparently, this was an episode from July 31, and Landis did indeed leave the show high and dry. 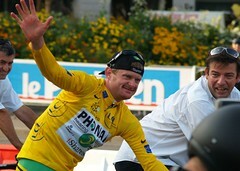 Tour de France winner Floyd Landis's father-in-law was found dead in his car Tuesday afternoon, an apparent suicide. The San Diego Union-Tribune reports that medical examiners are still investigating the cause of death, but initial police reports called it a suicide. David Witt, 57, who owned a restaurant in San Diego with his wife, was Landis's roommate soon after Landis moved to San Diego. Witt, who shared a coach with Landis, was dating his wife Rose at the time, and introduced Landis to her daughter from a previous marriage, Amber Basile. Witt and Landis served as best men at each other's weddings. “It could have been a few percentages of the whole maybe, or just another negative thing that he was depressed over,” said van Slyke, adding Witt had also been struggling under the strain of opening a new restaurant earlier this year. Phonak owner Andy Rihs announced today that the Phonak team, dogged by doping case after doping case, will close down at the end of the season. Rihs, who had brought in John Lelangue and instituted internal testing above and beyond the UCI's standards, said he couldn't find any sponsor willing to support the team, even at a single Swiss franc, or about 80 cents. Phonak had already announced that it would end its sponsorship at the end of the season, but Rihs had lined up the iShares group of Barclays Bank to take over. 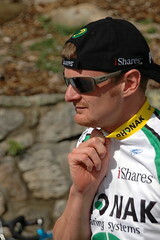 Now, with Phonak's Tour winner Floyd Landis facing revocation of his title, iShares has withdrawn from the agreement. For what's it worth I'll give you my two cents. First and foremost, Floyd did NOT, and I'll put that up again DID NOT test high for Testosterone like the whole fricken world is being lead to believe. His Ratio was high... and seemingly the media has forgotten simple math which states that there could actually be TWO things that make a ratio go up or down. Now Floyd's T/E ratio is high so that means either T (Testosterone) is high relative to E (Epitestosterone) OR the E is LOW relative to the T. Floyd's case is the latter. His testosterone level was completely normal. Now what about the isotope thingy? That shows exogenous (from the outside) testosterone. Good question, wish SOMEONE had the correct answer. It is seemly pretty good test but I'm also wondering to what degree are they seeing this? There are NO limits, just the presence of at least ONE Carbon isotope. Out of curiosity, it would be interesting to see the results if they tested ALL the TDF samples with that test. Then we'd see how many others showed this anomaly. The sad thing is people actually doping usually don't get caught since they know if you supplement with Testosterone you also need add some epitestosterone and WATCH your ratio. Most get caught by being careless or stupid. Now, do I like this, not really, but honestly if anyone believes that's why these guys are pro's (because they dope) they really need a huge reality check. They are pro's because they are GREAT athletes. Period. They work very hard, and are very gifted. A couple years ago some dillweed wrote a stupid article in "Outside" magazine about how he took "the whole deal" EPO, HCG, HGH, Steroids, was medically monitored, given a good training program, and supervision. He made HUGE gains.... Compared to WHAT? He felt incredible, compared to WHAT? He said he could climb better.. compared to WHAT? No times, wattages, or anything concrete was given on his performance gains other then "I felt like superman." Gee isn't that scientific proof at its best. Do drugs work - depends on what is your limiting factors and what drugs you're using. HGH does nothing for anyone under 40, and then it works on those who are NOT physically active since physically activity causes HGH to be secreted (it's a bit more complicated but for 99% of pro's this does nothing). EPO - well again if your limiting factor is oxygen to the muscles then yes, but for most, the limiting factor is the oxidative capacity of their muscles. The simple truth is that the highest hematocrit doesn't win the tour, the highest VO2 Max doesn't win the tour, nor does the biggest lung volume or lowest resting heart rate. No ONE factor makes you great. So when friends and family ask about this...cycling is no better OR worse then any other pro sport. Great athletes are great because they are great, NOT BECAUSE OF DRUGS. Weak, pathetic, lazy, people like to think they are tojustify why they aren't Pro's. Bottom line, work fricken hard and you'll get better. How much better... keep working hard and you'll see. Joe makes some good points and considering "one carbon isotope," I was shocked by Pound's screed yesterday. What governing body speaks like that and is accountable to no one? It's that's stupidity of Pound that I hope Floyd fights. Same thing with all of the unproven allegations in Operation Puerto. Careers are ruined, sponsors abandon, years of hard work destroyed all on allegations. If anything is the "year of excrement," as Pound says, it's WADA and irresponsible leadership. Andy Rihs, who owns the ProTour license for the Phonak team, will address the team's future at a press conference on Tuesday. Secondary 2006 sponsor iShares had announced plans to take over the team's primary sponsorship, and the entire Tour squad was signed to contract extensions, but that was all before team leader Floyd Landis had a drug test come back with a high testosterone/epitestosterone ratio. Phonak has fired Landis, but he looks likely to join a long list of Phonak riders who have been sanctioned for doping, a list that includes Tyler Hamilton, Santiago Perez, Oscar Camenzind, and six others in the last 3 years. QuickStep DS Patrick Lefevere, who is also president of the International Association of Professional Cycling Teams, has advocated suing Landis and kicking Phonak out of the ProTour. Meanwhile, Skoda withdrew from its contract as the primary auto sponsor of the Tour, and it's possible that iShares has informed Rihs that they intend to do likewise. Update: CyclingNews says that's just what has happened, and that Rihs has been unable to find a new sponsor. Their source is reportedly Blick magazine, but I can't find the referenced article. The AP reports that the locals believe Floyd and have rallied support for him. Reading this backgrounder on Floyd, you can see why. "If they are lucky enough to be on their bikes when he comes along, they might end up riding a few miles with the man himself. "He'll tie in with anybody," says Matt Barringer of I.E. Bikes in Murrieta, Landis' hometown bike shop. "You'll be going along at a comfortable pace, talking, but then when he gets to a hill, he'll say goodbye and tell you he's got to hit the hill hard." Floyd's a pro that rides with the locals and expect that support to continue through this long struggle. You'll find much less support from sports writers and Gwen Knapp writes about even sadder cycling tales. On of our readers commented that Floyd has posted a statement on his blog this afternoon. Floyd ask us to, "keep the faith" and continues on to tell his side of the story. The AP reports on the concerns about leaks and criticism of the UCI from Floyd's attorney and notes "the provisional suspension earlier this year of a high-ranking UCI official for leaking documents and-or information to" the French newspaper LEquipe. The article continues with the dispute of whether or not a CIR (to detect not natural elements) test was performed and what the results are. In this turn of the story, it's good to see Floyd's team on the offensive and Cyclingnews has more on his counter claims and the impending battle. The New York Times is reporting that Floyd Landis's A-sample was tested by mass spectrometry, and turned up differing carbon isotope ratios, which is generally a sign of synthetic testosterone use. Landis will now have to explain how the synthetic testosterone got into the sample, rather than attacking the admittedly weak baseline T/E ratio test. Landis finally requested a test of his B-sample today, which should give results before the lab closes for a holiday starting Monday. I rode next to a commuter that was really grinding the pedals over a bridge and he quipped, "I need testerone!" And I said, yeah, "a patch right on your balls!" (referring to the SI.com article) We both chuckled a bit, but the exchange did indicate the impact of this story and how the Landis story is everywhere. While I don't believe anything about pro cycling anymore, I'm relieved to see Landis on the PR offensive, getting his story out, and he's making a good case. As the story came out, my biggest concern was that we'd have another Tyler Hamilton story and the ill-fated "I believe Tyler" campaign. Landis has already done well to raise doubt, get support from Lance, bring on the doctors, and it isn't a confusing chimera defense. 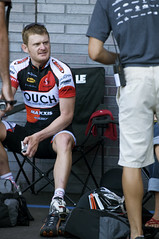 Don't look for Floyd Landis on the Tonight Show with Jay Leno tonight. Landis was scheduled, but cancelled after his A sample from Stage 17 tested over the testosterone/epitestosterone ratio limit. He will, however, visit America's greatest softball pitcher, the tried-and-true first defense of the scandal-plagued: Larry King Live. Landis will of course discuss his initial positive test. Another Floyd tidbit: FreeFloydLandis is a new weblog by somebody who knows more about this stuff than I do: Lots of stuff about 13C/12C ratios, IRMS tests, and ethanol. 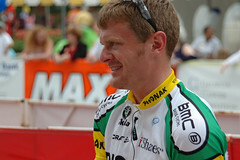 Tour winner Floyd Landis is racing at least a couple of European criteriums before returning to the US for some personal appearances, including a race in Chicago in mid-August, and a consultation on his osteonecrotic hip, which he hopes to have replaced in the next month. Depending on the checkup, he may also race the Tour of Britain from August 29th through September 3rd. CyclingNews offers a Floyd Landis rider's profile with a photo gallery of Landis throughout the Tour, and another angle on the post-race interview Landis gave reporters. At left, “Thanks from the champion !” by Hugo*/Hughes Leglise-Bataille, part of his excellent Tour de France photoset from Sunday. CyclingNews reports that all 9 riders from Phonak's Tour squad have extended. Axel Merckx signed for an additional year during the Tour, while Floyd Landis has extended for 1 year, and Bert Grabsch, Robbie Hunter, Nicolas Jalabert, Koos Moerenhout, Alexandre Moos, Victor Hugo Peña, and Miguel Angel Perdiguero all re-upped for 2 years. Note Discovery Channel in 15th.